Can Medicine Hat, poised for redevelopment of its downtown core, learn from Edmonton’s mistakes? The drive from Edmonton to Medicine Hat takes a little under six hours. It’s early January, and a chinook is blowing as I pass through Calgary and turn east on the Trans-Canada. The sunrise marks my destination—an early afternoon interview with Medicine Hat’s mayor, Ted Grimm. We’re to talk about the future of his small city’s downtown, and I have a faint sense of impending doom, wondering what’s become of the place where I spent my childhood summers. With Alberta’s two big cities to the west and north behind me, the sun finally rises to a straight stretch of the Trans-Canada running brown and flat, parallel to a power grid that goes on forever. Here, ironically, far away from congestion and traffic, one senses the dominance of the road, of highways and cars. The automobile is a symbol of the expanding wealth, freedom and development powering the transformation of this stretch of highway—now twinned where it wasn’t 20 years ago. That same wealth has powered the placement and expansion of strip malls in Red Cliff, five miles west of Medicine Hat. As I race past, its face is identical to every other small city along a provincial highway—a few hotels, a gas station, some buildings that service the retail, oil and agriculture industries. At dawn, the gas plants dotting the western edge of Medicine Hat look like ocean liners anchored to a brown sea. They represent half of the two principal industries that have fuelled the city’s development over the past century. The other is visible as the highway curves and descends into the South Saskatchewan River valley: a freight train slowly ascends the coulees, up from the CPR rail yards that bisect the downtown below. As the highway crosses the river, a sign directs travellers to turn left onto First Street and visit the historic downtown. To the east, a long line of malls and strip malls make up the merchandising part of the city. Instead I turn toward downtown. Newer bungalows line the riverbank to my left as I approach downtown. But a few hundred metres further along First Street, the neighbourhood ages—90-year-old elm trees populate boulevards, and soon I am enveloped in Edwardian Ontario. These stately houses lead on to the brick and marble courthouse, where my aunt worked for 25 years, and I turn east to reach Second and Third streets, the two main roads of downtown. They stretch for four blocks toward the CPR yards, where they’re forced to end and turn into one another, forming a rectangular circuit—the cruising area for teens and their hot rods on warm summer evenings. On the far side of the yards are what’s known locally as “the flats”: the warehouses and industrial buildings that used to service and stock the trains. My meeting with the mayor isn’t for another three hours and I reacquaint myself with a downtown I knew intimately in the 1960s and 70s. My grandfather, Alistair Anderson, was with the post office when he arrived in Medicine Hat in 1912. His job was to sort the mail in the postal car as the train snaked its way through the mountains to Nelson, B.C. My grandmother, Bessy, arrived from Hanover, Ontario, in 1917 after a long-distance, five-year engagement. The next 20 years saw the arrival of seven children, all born in a small house on Belfast Street, just up the steep eastern flank of downtown. It’s Belfast Street where I begin my tour. The buildings just around the corner at Aberdeen and Fourth Avenue are much the same, a red brick intersection that still houses Mad Hatter Books and a hardware store. A sense of downtown always began for me at this intersection. After Aberdeen, Fourth Avenue drops away steeply to the businesses below. Walking this as a child meant I was leaving the big houses and elm-lined streets for another world—of commerce and socializing, a Kresge’s lunch counter rendezvous with my grandmother and aunt. Today, downtown remains busy. Traffic now moves along in opposite directions on Second and Third streets, speeding down the one-way streets that are the darlings of car-oriented planning. The blows that Third Street took when Eaton’s, MacLeod’s and Kresge’s went out of business have led to some innovative reworking of vacant buildings. The Eaton’s building, in particular, has been internally redesigned into smart boutiques and a coffee shop. Downtown Medicine Hat appears to have weathered the assault of suburban malls surprisingly well, even if the number of vacant buildings remains high, especially as I near the rail yards. The Turpin Block, one of the best- refurbished Edwardian buildings in the city, was gutted by fire in December of 1999, but is in the process of being rebuilt. Unlike Lethbridge, which over the past decade has levelled its rail yards and most of its downtown in favour of a different kind of commerce, downtown Medicine Hat appears to be holding onto some older sense of itself and its surrounding neighbourhoods. A futile vision or visionary planning? Ted Grimm, to his credit, is a politician of remarkable candour. He isn’t afraid to speak bluntly. In a large urban centre with more pronounced conflicting interests, this would get him into trouble, but I suspect that in a city of 50,000 the rules for politicians are quite different. You wear your pride on your sleeve in Medicine Hat, as well as your criticisms, and if someone objects, you meet for coffee, have it out, and part with a certain respect for each other. But Grimm’s introduction sparks my cynicism, born of capital city politics. For most of 1999 I’d researched the redevelopment of downtown Edmonton, and in the city council debates over what to do with the vacated CN lands along the northern boundary of downtown, I witnessed meaningless boosterism (from the mayor) and short-sightedness (of certain councillors). I brace myself for an interview along similar lines. Medicine Hat has never ceased to surprise me with the eccentricity and originality of its citizens—photographer Roloff Beny and puppeteer Ronnie Burkett are from “the Hat.” As our conversation continues, I feel euphoric. Edmonton’s mayor could learn a thing or two here. I’m discovering a politician who can articulate a vision of urban planning. Medicine Hat is poised to begin a redevelopment of its downtown. It will involve more than compromises between different market forces. It will involve a clash between ways of looking at the world—accepting or rejecting the rights of people to live their lives in ways other than majority market forces dictate. It will involve a clash between ideas about what constitutes beauty, pleasure and liveability in urban spaces. As our meeting comes to a close, and Grimm drives me around the city showing off its strengths and history, I want to suggest that Medicine Hat look no further than Edmonton to see how these questions, if effaced or ignored, create an urban nightmare. In the mid-1980s, Canadian National Railways began to disassemble the rail yards that occupied a block-wide section of Edmonton just north of downtown, stretching almost 20 blocks from 97th to 116th Streets along 104th Avenue. Canadian National had spun off the development arm of its landholding division into Canada Lands Co. Ltd., and began to sell and lease the property to developers for commercial projects. Developers and architects must accept responsibility for their decisions and stop blaming “market forces” for creating buildings that prove ugly and unfriendly to neighbourhood residents. In 1989 the City of Edmonton planning department released the Oliver Area Redevelopment Plan (OARP) that proposed the CN lands be zoned to include at least four blocks of housing, 3.7 acres of urban parks space, and mixed commercial development. 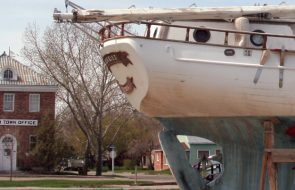 The plan was approved by city council that year, except that CN asked for and received rezoning for an additional block of commercial development. This was to be the first of a string of concessions that revealed the weak will of civic politicians. The concessions also revealed serious miscommunication within the city’s administration about what Planning and Development wanted the lands to be and how Transportation viewed 104th Avenue, the main road- way along its southern flank. At some point, developers and architects must accept responsibility for their decisions and stop blaming “market forces” for creating buildings that prove ugly and unfriendly to neighbourhood residents. Where are developers of vision to ask the city for a boulevard between lanes, or request a wide, decorative sidewalk with newly planted trees, in exchange for a commercial space opening onto those same sidewalks? How much is the redevelopment really about market forces and the consumer determining the look of projects, and how much about developers and their tenants cultivating the suburban- style consumer downtown? The final stand for 104th Avenue came in June 1999. A proposal for developing the last parcel of free land between 112th and 114th Streets contained plans for a strip mall and twin residential towers along the northern boundary of the same two blocks (also designed by Kassian Kennedy Architects). The plan required rezoning to reduce the amounts of residential development and park space (now down to 0.7 acres of the entire CN lands). The City Planning and Development department recommended rejecting the rezoning because the OARP “envisioned residential developments on these lands.” The two councillors for the ward, Michael Phair and Jim Taylor, both voiced disappointment over the unwillingness of the developer to guarantee the construction of both residential towers before commercial development could begin. The ward councillors for West Edmonton, Wendy Kinsella and Leroy Chahley, pressed home the maintenance of 104th Avenue as a freeway, with Kinsella going so far as to suggest “a buffer” to stop pedestrians from crossing the road at unwanted locations, slowing down, one would assume, her drive home. Rose Rosenberger, councillor for another ward in the city’s northwest, worried that voting down the project would mean another parking lot downtown. She then voted in favour of a project that turned over half of the land fronting 104th Avenue into precisely what she had wanted to avoid. The most vibrant parts of downtown Edmonton now gravitate south of 104th Avenue, onto the walk- able streets that stretch toward Jasper Avenue. People live and work in Oliver for good reasons, chief among them a belief that city living can involve a brisk walk to work or to the grocery store, and not a forced excursion in an automobile. The enormous urban population living on the fringe of the downtown business core started architects, landscape designers, urban planners and civic leaders in Edmonton thinking about how the downtown to the east of Oliver ought to look. Edmonton’s former downtown plan, completed in 1980 at the height of the boom, was predicated on megaprojects and office towers—the staple of economic activity in both Edmonton and Calgary before oil prices collapsed. With nary an office tower built in over ten years, the 1980 plan was, needless to say, out of date by May 1994, when city council struck a steering committee to come up with a new plan that better reflected economic and neighbourhood realities. The Capital City Downtown Plan (CCDP), adopted by city council in April of 1997, won three major urban design prizes, including the prestigious “Downtown Achievement Award” from the New York based International Downtown Association. Housing, from the outset, played an integral part in the CCDP. Not only would the downtown warehouse district be rezoned to accommodate more living units, but the already existing residential areas close to downtown would be included as a part of the development zone. The plan would create walkable access from those areas to the retail core. Grant MacEwan Community College campus has been included from the CN lands, as well as adjacent land, which has been zoned for student housing. Wide, brick-inlaid crosswalks have been built to bridge the eight lanes of traffic across 104th Avenue, and street-front, pedestrian-friendly retail development is emerging along the streets that intersect with the college. Johnson and other participants who helped write the plan remain optimistic about its implementation. Spurred on by the Downtown Housing Reinvestment Grant, a municipal program offering developers $4,000 for each housing unit built downtown, some 1,200 units of condominium development and warehouse loft conversions are racing to completion. Doug Carlyle, a former member of the steering committee, and a landscape architect, agrees. “Downtown needs visible signs of life. And it’s such a big place. It’s taken more than 100 years to get where we are, yet we’re an impatient lot these days. The issue of 104th Avenue is a real barometer of the culture of Edmonton and Alberta, and it has to do with the way we see downtown and cities. 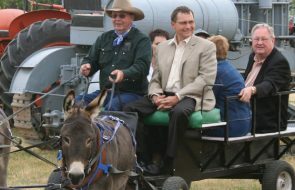 Back in Medicine Hat, Mayor Grimm drops me off in front of City Hall. I walk back up to Third Street, where my car is parked in front of the old Kresge’s building, now partitioned into a ScotiaBank branch, a clothing store and law offices. No hint of my favourite lunch counter. I’m in the mood for a coffee, and unexpectedly find a new shop right across the street called the Roastery. The owner finishes chatting with the local “Culligan Man,” and joins me for a brief talk by the front window. His name is Walter Knihnicki, a new arrival from the Kootenay region of B.C. Knihnicki directs me to another business, Labels for Men, a clothing store that contains some of that “funk” that downtown needs more of. Its owner, Eric Springman, fills me in on some of the divisions and politics of down- town planning. Located downtown for 11 years, Springman is a member of the Downtown Revitalization Zone, one of two such zones—the other, the North Railway Exchange, is on the other side of the tracks—that are sometimes at odds. 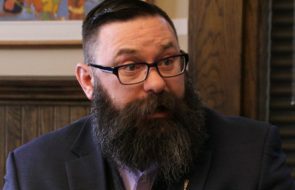 Springman thinks the committee struck by city council should focus on his side of the tracks, traditionally the centre of Medicine Hat, in order to re-establish a downtown as the social heart of the city. The right and wrong side of the tracks. Years ago in Medicine Hat, when my mother was a girl, the kids living on the streets immediately above downtown used to refer to the kids in the valley on the other side of the tracks as “flats bums.” The rail yard defined and divided the down- town, and really it still does. There are no immediate plans to move it. In Medicine Hat, that reality may yet pay off. It should force Mayor Grimm’s task force to create a downtown plan that won’t allow for car-dominant commerce. Edmonton, too, was once dominated and contained downtown by rail yards. With their removal, a feature that explained the way the city looked suddenly disappeared. The historical sense of downtown was crippled, and the vacuum created by that sudden loss sucked in a foreign, suburban idea of space and how to tame it, an idea built on a car-oriented view of the world, lacking respect for pedestrian-sensitive neighbourhoods. I have these three wishes for Medicine Hat. First, rebuild the walkway beneath those still-bustling rail yards, and create a pedestrian mall linking the two competing halves of downtown into a strollable whole. Second, return downtown streets to two-way traffic. One- way streets become speedways, and they are disorienting for visitors. Two-way traffic encourages people to drive to a neighbourhood rather than through it. Edmonton recognized this in its Capital City Downtown Plan and changed many streets back to two-way traffic. Third, and most importantly, never, ever move those trains from the centre of town. They have provided a stopgap for planning that doesn’t care one iota for anything other than speed and consumption. Edmonton once had rail yards in two parts of the city—downtown and Old Strathcona. Now only one remains. The yards in Strathcona have gone a long way in restricting roads in South Edmonton, and have created the most vibrant, exciting, walkable neighbourhood on the prairies. Downtown Medicine Hat should expect nothing short of the same. From 1993 to 1997 Norm Sacuta studied cultural and literary theory, including the postmodern and urban space, at the University of Sussex. He is a freelance writer, and a project manager for a multi-media company in downtown Edmonton. His offices on Jasper Avenue overlook three square blocks of parking lots.